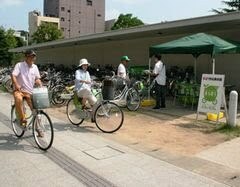 Beginning in September 2010, bicycle rental projects have been established in the Japanese cities of Saitama and Fujisawa. As part of a project to promote the use of bicycles and develop a traffic system not centered on automobiles Saitama City conducted a bicycle share experiment in the city between September 25 and October 22. Rental bicycles were made available at various points around the city, which could be used by the public without pre-registration, but pre-registered users were able to use bicycles at a lower rate. Meanwhile a bicycle sharing project between industry, academia and government was begun in Fujisawa at the beginning of September 2010. Both projects are part of a larger trend in Japanese cities, including Kyoto, Toyama, and Kanazawa, where rental bicycles are being promoted as a viable alternative to automobiles.